Get the reliable INFINITI service you deserve at our INFINITI dealership in Pittsburgh, PA. 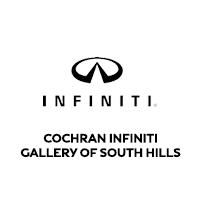 Whether you’re looking for INFINITI Express Service for routine INFINITI maintenance like an oil change and tire rotation or your vehicle needs more extensive INFINITI repairs, you’ll find the help you need at Cochran INFINITI Gallery of South Hills. Schedule INFINITI service online now to book your next appointment! Our Pittsburgh INFINITI service center also has plenty of genuine INFINITI parts for sale, as well as INFINITI accessories that will truly make your ride your own. When it’s time for new tires, don’t hesitate to browse our online INFINITI tire store and find the right new tires for your specific INFINITI model. We also have INFINITI service specials that can help you save. Turn to the talented team of INFINITI service technicians at Cochran INFINITI Gallery of South Hills for your INFINITI wheel alignment, brake service or engine repairs.